I was surprised to discover that this particular wide view of Luggala (Fancy Mountain) taken from the north has not been added here before. 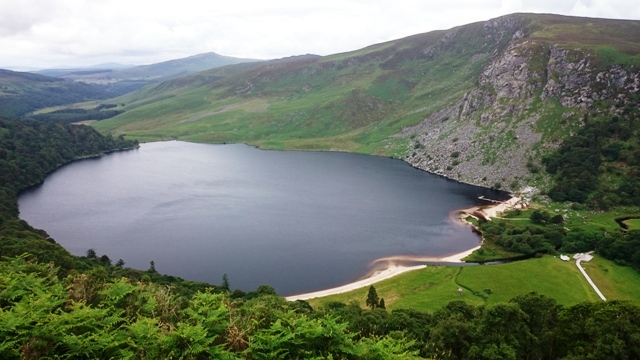 It includes the famous “Guinness Lake” (Lough Tay) which resembles a dark pint with a creamy head to some. The photo was taken from the R759 road that links the Sally Gap and the R755 road to Roundwood and Glendalough. Several small gravel car parks are carved out along this sometimes narrow and winding road. The feeling of a sheer drop down to the lake below just over the little stone wall adds a thrill for those motorists unfamiliar with the road.